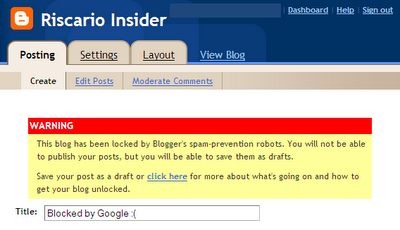 RISCARIO INSIDER: Google Locks This Blog As Spam ?!? Google Locks This Blog As Spam ?!? These products are getting increasingly integrated, which makes them even easier to use. And there are others that I don't currently use much. 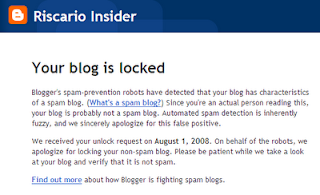 Your blog has been identified as a potential spam blog. To correct this, please request a review by filling out the form at [link]. Your blog will be deleted within 20 days if it isn't reviewed, and you'll be unable to publish posts during this time. After we receive your request, we'll review your blog and unlock it within two business days. The message is pleasant enough, but still unnerving. I clicked on the link and waited impatiently for reactivation. While you wait, you can draft blog posts, but not publish them. The reactivation, took place two calendar days later on Sunday. This is faster than the commitment of two business days (which would have been Tuesday). However, I missed my schedule of posting early on Sunday morning. Surprisingly, Google didn't send an email to say my account was reactivated. I only found out by logging in. There are many reasons to use Google products. Since they have the most popular search engine, using their other Google products may give higher rankings in searches (certainly can't hurt). There are ongoing enhancements and since Google's offerings are web-based, you skip the hassle of installing upgrades. What's more, Google's tools are completely free. There's no obligation to show any advertising. What does Google do about potential spam blogs hosted elsewhere? Maybe they get removed from Google web searches without warning. At least I got a friendly email. So I'm sticking with Google until I decide to start spamming for real! Labels: blogs, buyer beware, huh?